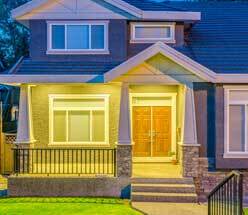 Residential railings play a key role in the safety and décor of your home. Residential railings not only add visual flare to your home, they also protect your loved ones from tripping or falling over a dangerous drop-off. That is why we make sure to provide top-of-the-line residential railings to our Central Illinois customers. Your safety and the well-being of your family is our number one goal. Does aluminum ornamental railing not match the style of your Central Illinois home? Vinyl may be the solution for you! Digger offers a lifetime transferable warranty and is made in the USA. Click here for Polyrail styles and colors. 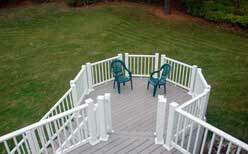 Contact Hohulin for Your Residential Railing Needs! For over 100 years, Hohulin Fence has been the trustworthy choice in fencing and related products. So choose Hohulin for your residential railing needs. If you are interested in residential railings for your home, contact us online or call us at 309-316-1008 today! For other residential fencing products, please visit the following pages: Chain Link Fencing, Vinyl Fencing, Ornamental Fencing, Simtek Fencing, Hot-wired Fencing, Residential Kennels, and Gates & Operators.